One of our English speaking drivers will meet you at your hotel or pick up location with the vehicle requested to take this beautiful tour of Rome that allows you to sit comfortably and visit the Major Rome Highlights at night when all is illuminated. We will take you on a unforgettable evening tour that will allow you to witness the ancient origins and the successive cultural and historical stratifications which characterise the city of Rome. 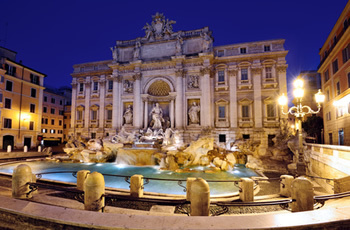 Starting from your hotel, we will drive through the famous Via Veneto, Porta Pinciana, Villa Borghese, Piazza del Popolo, Piazza Augusto Imperatore, Via del Corso when we arrive at the world famous Trevi Fountain, where we will make one of our stops for a visit. From Via Nazionale, descending towards Piazza Venezia, we will also see the Memorial to King Vittorio Emanuele II, the Tomb of the Unknown Soldier the Palace of the President of Italy. 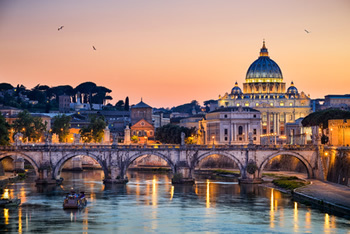 The itinerary will also take you through Navona square, the Pantheon, Capitol Hill, the Imperial Forum, the Colosseum, the Palatine Hill, the Aventine Hill and the Circus Maximus. 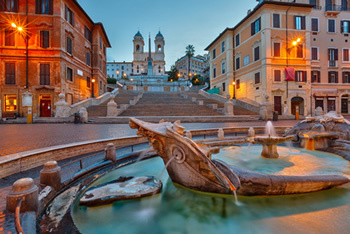 We will then continue on to the Spanish steps area so you can also witness the Roman night life. From the bustly musical and fun area of Trastevere we will then go up to Gianicolo Hill, a privileged point of the city for a panoramic view of the city. On our return we will pass by Castel Sant'Angelo and St. Peter's Basilica. Duration of this daytrip: 3 hours. Doesn't include Dinner, Entrance fees and gratuities.